You see, it’s an attic room, pine-panelled, with a basin by the window, an old dresser, a very comfortable bed and some nice pictures. The bathroom is in the hallway and has a nice shower with plenty of hot water. For dinner Mireille asked us what we wanted: chicken, beef, fish, rice, potatoes, etc. We asked for fish with rice and a salad. We ate a trout each with butter and almonds and rice that had a perfect texture and flavour. It was all so delicious. We had more than enough to eat. For dessert we were served lemon ice cream. He is standing with his back to the window, slightly out of focus. 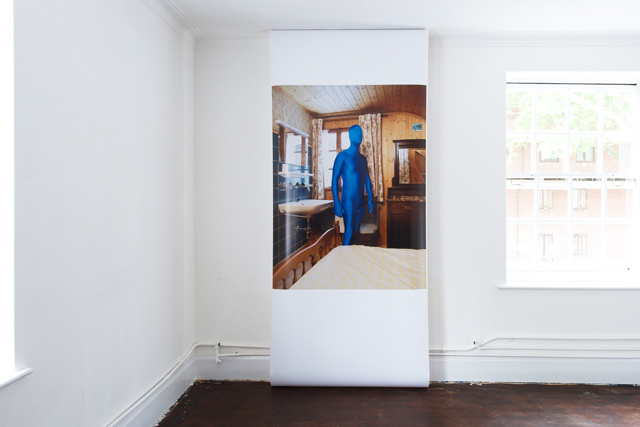 His chroma-key-blue skin suit smooths and sculpts his body, eyeless head gazing into the distant wood-panelled corner of the room, masked hands finished with careless glove fingers. The man last seen there 32 years earlier was his father. We're sorry, but it is currently not possible to make reservations for this hotel.